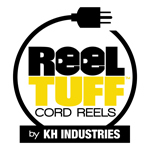 ReelTuff Retractable Cord Reels are rated 600 volts and feature all-steel construction. These rugged, Made in the USA cord reels are rated for NEMA 4, NEMA 4X, and Class I Division 1 Hazardous Locations. Nov. 8, 2011 - PRLog -- ReelTuff Retractable Cord Reels are industrial grade are built for NEMA 4, NEMA 4X, and Class I Division 1 Hazardous Locations, including indoor and outdoor, wet and dusty locations, and hazardous environments. ReelTuff Cord Reels can accommodate from 10’ to 150’ cable length. Common cord reel configurations are in stock and ready for immediate shipment. Cord reels can also be customized by cord length, conductor(s), cord gauge, cord type, and pre-wired plugs, connectors, and outlet boxes. The RTB Series Power Cord Reel offers excellent performance at a competitive price and is rated NEMA 4 for indoor/outdoor (wet) locations. The RTB cord reel has a 30-Amp/600-volt rated slip ring and can accommodate 16-12 Cord Gauges with 2-12 Conductors. The RTF Series Power Cord Reel is for heavy-duty applications and is suitable for wet, dry locations and corrosive environments with a NEMA 4X enclosure rating. The RTF cord reel has a 35-Amp/600-volt rated slip ring and can accommodate 16-10 Cord Gauges with 2-12 Conductors. The ORI and RTM Series Retractable Power Cord Reels accommodate up to 150’ of cord on a heavy-duty, formed-steel stand. They are NEMA 4 rated for indoor and outdoor (wet location) use and come with a 35 to 150-Amp /600V rated Slip Ring that can accommodate 16-2 Cord Gauges and 2-30 Conductors. The KH RTS Series Retractable Power Cord Reels are certified and listed for Class I Division 1 Hazardous Locations. When ordered with a pre-wired KH Hazardous Location Work Light, they provide a turnkey solution with explosion-proof lighting and power in hazardous environments.